Don Rojem at the 2016 Consolidated Convention. DONALD JAMES ROJEM, the 65-year retired member whose poetry inspired many inside and outside the Brotherhood, passed away October 15. He was 88. Rojem, a member of Local 169 (Detroit) who retired to Alabama, traveled widely as a construction Boilermaker. His experiences on the road provided a rich palette of memories he drew from when he took up poetry in retirement. 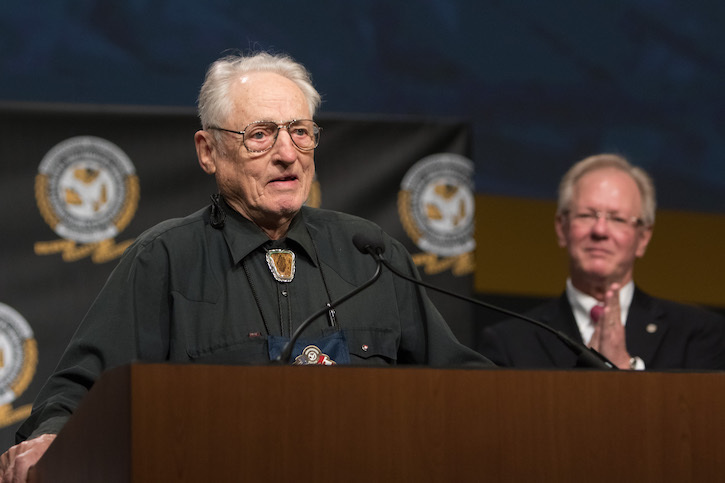 During the 33rd Consolidated Convention in 2016, International President Newton B. Jones called Rojem to the stage to read one of his poems. Rojem also was featured in a video created for the convention. “Don was truly a special person who loved boiler making and the Brotherhood,” said Jones. “He led an adventurous life. When he was quite young, he began logging, farming, seafaring and other work before finding a home with the Boilermakers. His poetry covered many topics. What he wrote about being a Boilermaker will live on in our organization. A profile of Brother Rojem was published in a 2016 issue of the Boilermaker Reporter.